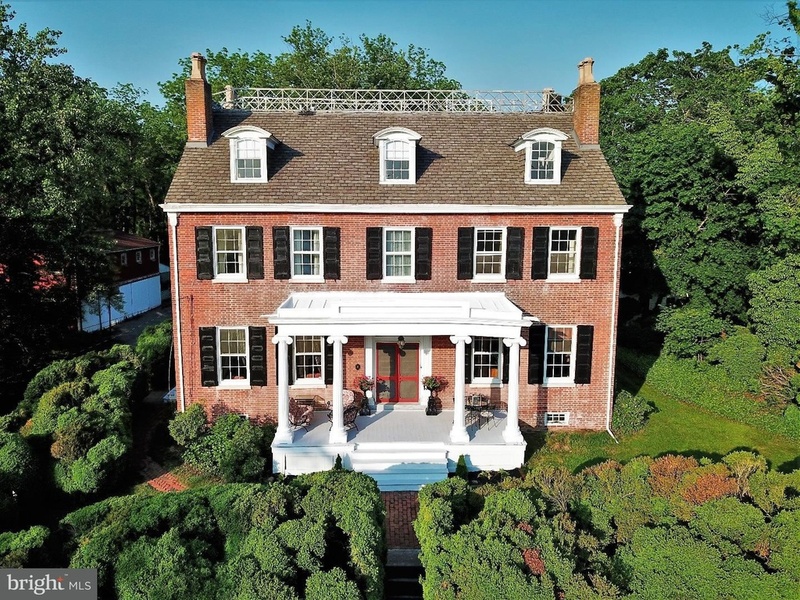 Circa..1836 and known as the Josiah M. Reeve House This handsome brick colonial home was built with the architectural ideas of the Greek Revival period. The builder of the home was Josiah M. Reeves and in a partnership with his brothers, William and Emmor operated a shipyard along the Alloway Creek between 1831 and 1859. The center hall features a hand painted mural depicting the Reeves brothers homes in Alloway at the turn of the century, a freestanding circular staircase, original plaster mouldings and medallion. 10 1/2 foot ceilings, 6000 square feet, 10 fireplaces, wide plank pine flooring, original doors, hardware and wood trim are throughout this historic gem. The living room was originally two parlours, but was opened up in the 1930’s or 1940’s to make a ballroom and boasts matching black Italian marble fireplace surrounds with ionic columns and Tuscan shafts. Formal dining room has a black marble fireplace with gas logs, antique mantle mirror, warming cupboards and a side entrance door with fan window, which is accented with decorative tracing. The winter kitchen offers a large cooking fireplace, tin ceiling, exposed brick wall, granite counter tops, access to back stairway. Summer kitchen contains a large walk-in cooking fireplace, original built-in cabinets and access to the 18 x 24 blue stone patio. In the back of the first floor the home has two additional rooms that could be used as dining area’s, office space, game room or media room. Second floor has a large center hall, 4 bedrooms, 3 full bathrooms and laundry room. Walk up third is finished with 3 bedrooms, full bathroom and a living room/recreation room. Located on 4.42 acres the outside features a large 4 car barn with attached screened porch and awnings, spring house, small pond, brick patio and walk ways, slopping terrain, many large trees for shade. Another interesting outside feature is the captain’s walk which extends between the double parapet chimneys at the peak of the roof. Close to Alloway Lake!!! Please call today for all the details….